*North goes back-to-back - the Kangaroos' 1965 night premiership win was their first senior flag since entering the VFL in 1925. They quickly added more silverware to their trophy cabinet by winning the 1966 series, in the process joining South Melbourne (1956-57) and Footscray (1963-64) as the only clubs to win consecutive night premierships. a centre square of 50 yards marked on the field, with only four players from each team permitted in the square when the ball is bounced in the centre circle (adopted in a modified form in 1973). *Prizemoney - during 1966 Australia switched from the imperial to metric system of measurement and as part of this change the national currency changed from pounds to dollars. This meant series prizemoney was converted from £1400 to $2800 for the winning team, and from £650 to $1300 for the runner-up. These values remained unchanged for the rest of this era of the night series. *Crowd numbers crash - after setting a new seven-game series record of 153,365 spectators in 1965, crowd numbers in 1966 slumped to just 94,900; the third-lowest total in series history. This signalled the start of a steady decline with attendance totals dropping every year (except 1971) throughout the rest of this era. 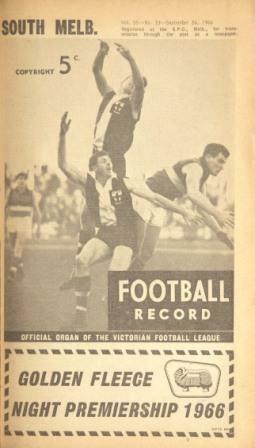 *Leading Goalkicker of the Series - North Melbourne's John Dugdale led the scoring with 14 goals from three matches. Originally scheduled for Sept.13 but postponed due to torrential rain. That exhibition match was also Peter Hudson's debut in Hawthorn colours.